This post is sponsored by Singin’ in the Rain and Nuffnang. Yes, I really did scream when I was asked to review the Australian production of the musical Singin’ in the Rain. Last Friday, the hubster and I headed out on a rare date night. Rare because date nights are few and far between for us. And rare because he actually agreed to come to a musical! LOOK AT US. Date night. Much love. Musical excitement. All aglow. I’m a big fan of the theatre, and musical theatre in particular, but had not seen Singin’ in the Rain. I almost did some research before attending, then decided to simply sit back and let the musical win me over. Or not. Spoiler alert: it wasn’t perfect. But perfection is a ridiculous standard to set, so I’ll stick to the main point. And that is that it totally won me over. 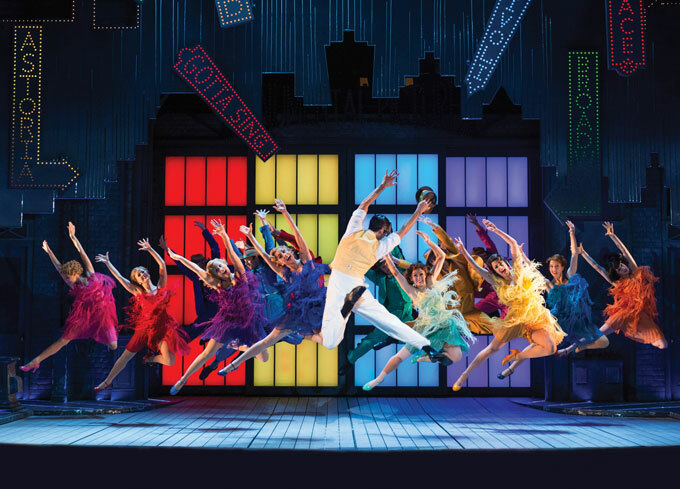 Singin’ in the Rain is a fabulous night out. Great songs, great choreography, lots of colour and pizzazz, fabulous comedic timing, great performances and bucketloads of rain and splashing. The main cast of Singin’ in the Rain. 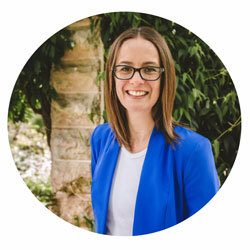 Photo by Brian Geach – used with permission. Erika Heynatz is hilarious as Lena Lamont, the silent film star whose screeching voice makes transitioning to the talkies near impossible. Her solo song, What’s Wrong With Me?, was a highlight of the show. Jack Chambers is brilliant as Cosmo Brown. I spent the whole show feeling that I’d seen him before, and put it down to my general love of musical theatre. It wasn’t until I read the media kit that I realised he was the winner of season 1 of So You Think You Can Dance. Of COURSE he was! He’s JACK! Perhaps they should have called it So You Think You’re a Triple Threat. He still would have won. He completely steals the show, and he does it early with Make ‘Em Laugh. Gretel Scarlett is wonderful as Kathy Selden. Beautiful dancing (to this untrained eye), beautiful tone (to this long-ago-trained and long-out-of-practice ear), and her crystal clear long notes with late vibrato raised goosebumps. Every time. Adam Garcia as Don Lockwood. Photo by Brian Geach – used with permission. Now to the star of the show. Adam Garcia. I realise this opinion may be unpopular, but he falls flat for me. His voice sounds thin beside those of his co-stars. Which is not to say he can’t sing – of course he can. But there were no goosebumps. At times, I almost couldn’t hear him at all. On that note, on to the dancing. Australian cast. Photo used with permission. I have no expert words to offer on the choreography, except to say that it is super fun and, to this eye, seamless. The crowd scenes flowed, with all manner of things and cast members flying through the air. Struts met dance met slapstick met caricature faces. So fun to watch. And all in front of fabulous sets. The venue. Her Majesty’s Theatre is not my favourite venue, and that was as true that night as any. The seats are packed in (my husband commented that it felt like he was on a plane), and are not raked enough for the shorties of the world (which doesn’t include me, but apparently included the loud grumblers sitting behind me). My husband also asked that I note they do not sell choc tops. He was extremely disappointed with this. Turn around, people. Go home. Nothing to see here. 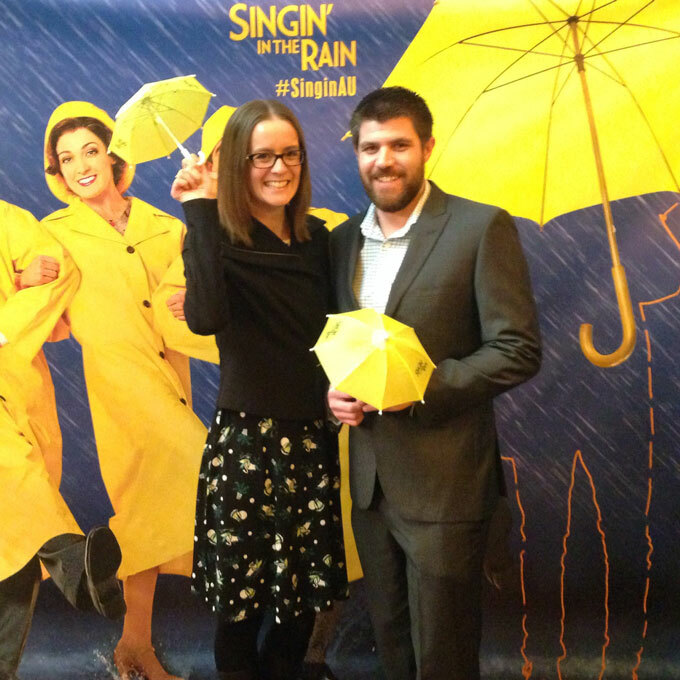 Singin’ in the Rain is a great night out. Highly recommended viewing. Congratulations to the cast and crew, and chookas for the rest of the show’s run. 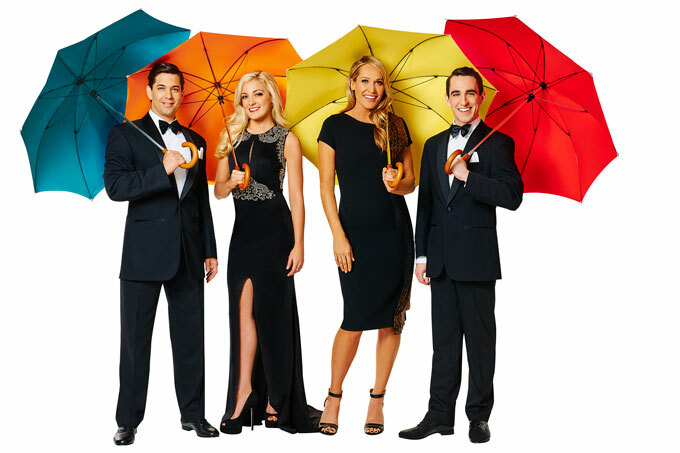 Singin’ in the Rain is now playing in Melbourne. It’s at Her Majesty’s Theatre until 3 July, before moving on to Sydney, Brisbane, Adelaide, then Perth. All tickets are on sale now. And if you’re as big a fan of choc tops as my husband is, you’ll just have to bring your own. Have you seen Singin’ in the Rain? What did you think? I really want to go! I love the movie…. Oooh, nice! I’ve seen two musicals already this year. Probably greedy that I want to get to The Sound of Music as well! Also wouldn’t mind a cheeky night out at Little Shop of Horrors. SEYMOUR! I love musicals! This one sounds fun! Oh I would love to see this! Maybe I should get myself to a theatre when the show heads to Sydney! I felt the same! Although my kids are big fans of the movie ‘Robots’, so I was always singing ‘Singin’ in the Oil’. Ah, Fender. You crack me up. Ah, I know who you mean! And I see the resemblance. But no, her name was Naomi and there’s no mention of The Voice in Gretel’s bio. I really enjoyed the show and agree that Erika was hilarious and Jack was brilliant. Sorry I didn’t end up getting a chance to come and say hi, I spotted you during intermission but as I got up to walk over the lights when down and it was crazy busy with everyone exiting at the end! Glad you enjoyed your night and bonus points to you for getting your hubby to come along! No need to apologise! The crush after the show was manic! I LOVE the movie, as do my boys. Getting the big boy out is sometimes a challenge though! I hear you! My husband took the kids to see Kung Fu Panda 3 on the weekend. I’m scared to ask him which he enjoyed more. Yes, a lot of colour and a lot of fun. And a lot of water! Oooh, enjoy! I sound overly picky with the venue, don’t I? My main dislike at the Maj is the dress circle – the stairs are really steep and narrow and, as a lifelong unco, I always feel like I’m going to tumble down the stairs and over the balcony! I love the little umbrellas you are holding..did you get to take them home? 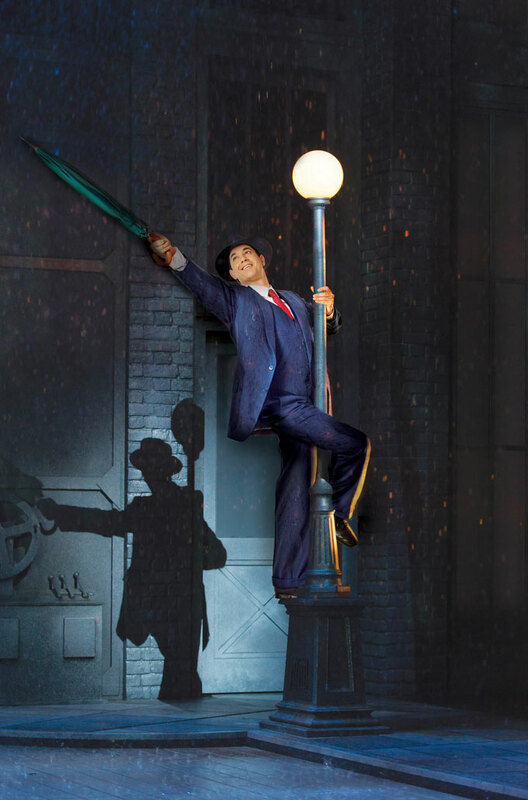 I only love the singing in the rain song with Gene Kelly singing and dancing and have been known to put up with the rest of the story line just for that bit. The kinder kids (all of the 4 classes !) did Singing in the Rain at a school musical a while ago and I adored them all with their little umbrellas. The umbrellas were just for the photobooth Denyse – although I think you could buy them from the gift area! We didn’t get to keep these. Interesting that you comment on the storyline. As a newbie to the plot, I did struggle with how Kathy went from dismissing Don to returning his love, but figured I was missing something or that it was better explored in the movie. I’m so glad you got to go. I have a feel Boatman would complain about lack of choc tops also. Did you get to keep the tiny umbrellas? Hubster and Boatman really need to meet. (As do we. Like whatevs.) We didn’t get to keep them, but they were available for purchase. So we could have if we’d REALLY wanted them. Oh my God!! I so want to see this. I hope it comes to Brissie. Those photos look amazing. I’m glad you guys had a chance to get out together. Dave is obsessed with musicals lol. I don’t know what that says about him really haha. I would totally go! It sounds pretty rad.